Drive southwest of Sandersville along the appropriately named Kaolin Road, and you see them rising up tall and white in the distance. Smoke billows from thin stacks, and the air is filled with a fine dust. A steady stream of dump trucks – many stained brown – rumble along the narrow roads to the processing plants where they dump their loads of clay. They leave empty heading back to the mines that dot the landscape between here and Milledgeville to the east. Other container trucks pull out filled with heavy bags of the processed kaolin, along with tankers topped off with liquid slurry. Since its discovery more than a half century ago, this white aluminosilicate clay has been the region’s primary source of wealth. It has a seemingly endless variety of uses, from cosmetics and toothpaste to paint, rubber, smoking pipes and most famously over-the-counter stomach remedies. A decade ago, nearly everyone here seemed to work in the mines or plants. No more. When deposits were discovered in low-wage countries like Brazil and prices tumbled, the once bustling industry started to scale back. These days roughly a thousand people are still employed, where once a single plant could boast that many workers. Lee knows firsthand how important clay was to the community. For years he owned the local Ace Hardware and saw sales rise and fall with the fortunes of clay. Kaolin has gone through its own transformation. In years past, plants that were locally owned were bought up by outside corporations, which were sometimes reluctant to put as much into them, according to County Commission Chair Horace Daniel. Despite that resurgence, local leaders admit that the days when this county – located halfway between I-20 to the north and I-16 to the south – could depend on a single industry are gone forever. Now the county is in the hunt for jobs wherever they can find them. Those jobs are increasingly being found in some other natural resources here, like pine trees and the long months of warm sunshine common to this part of Georgia. Three very different energy companies have staked out sites in Washington for plants. 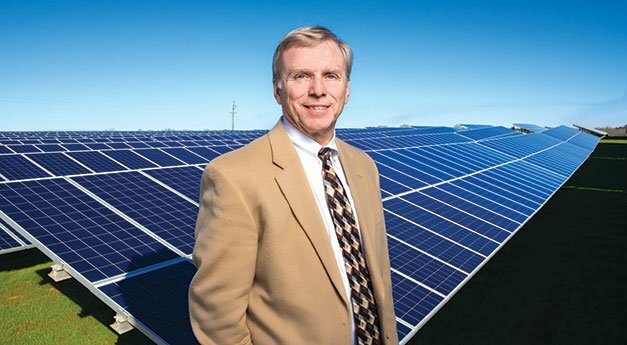 The first to create a beachhead here is Virginia-based Dominion, one of the nation’s largest energy providers. Last year the company acquired a solar energy development project from Smart Energy Capital and Jacoby Development. The Azalea Solar Power Facility just outside the small town of Davisboro is a vast field of solar panels tilted up to the sun. Energy produced by the photovoltaic technology – an expected 7.7 megawatts in all – is being fed into a nearby transformer station for shipment to Cobb Electric Membership Corp. The co-op signed a long-term power purchase agreement for the cleanly produced current, assuring its profitability. Like much of this part of Georgia, Washington County was once essentially an agrarian society. On country roads you still find abandoned wooden houses, known as Georgia Crackers, standing as a reminder of the old days. Row crops aren’t so important any more, but a newer kind of farming has started to take its place. The first to take advantage of the county’s abundant timber is likely to be a company called General Biofuels Georgia, LLC. The firm announced plans to construct a wood pellet manufacturing plant in Sandersville. Once it’s up and running, the plant will be able to convert trees into industrial-grade wood pellets for sale to European utilities. Its proximity to rail with a clear path to the Port of Savannah makes the location ideal. The company has committed to investing $60 million in the plant, which is expected to produce approximately 440,000 tons annually and employ about 35 people. While production could start in 2015, the plant is still wrangling with environmental regulations that could push the start date further into the future. Local leaders are also hoping that one big energy project will finally move from proposal and argument to construction. Since it was first announced in 2008 by a group of investors headed by local businessman Dean Alford, the idea of a coal-fired power plant has generated great hope and lingering controversy, but no electricity. At least not yet. Dubbed Plant Washington, the estimated $2.1-billion project would generate 850 megawatts of power for the 10 electrical co-ops that signed on to support it. In a region where jobs are scarce, the four-year construction phase was projected to employ 1,600 workers. Once up and running, the plant would need 120 to 130 skilled professionals generating nearly $7 million in wages annually. Announcing it was the easy part. In the years since then, the plant has gone through a series of twists and turns. Changes in carbon emission standards have made building a coal-powered plant harder to do. A bigger issue has been the economics of coal itself. Natural gas has gotten cheaper and more abundant thanks to fracking techniques that made vast and previously unreachable reserves available. At the same time, alternative energy sources like wind and solar power have also come down in price, and utilities are increasingly being pushed to add more “clean energy” from these sources to their mix. The Washington project was originally funded through POWER4Georgians, a consortium of 10 electric co-ops led by Cobb EMC. The 10 co-ops no longer financially support the venture, although four of them still plan to purchase electricity from the plant if and when it is up and running. Since then, Colorado-based private investment group Taylor Energy Fund LLC has stepped in to finance the pre-construction costs. The plant has sparked heated opposition from local citizens and groups concerned over the plant’s cost and potential effect on health and land values. Cummings references an analysis by public policy and financial consulting firm TR Rose Associates that found that power generated by the plant would likely be more expensive than other sources and could substantially raise electrical costs for the EMCs with power purchase agreements. Local leaders say developers are moving forward with the plant and construction could begin sometime in the next year. With its open and sparsely populated land, Washington County was a good location for a plant like this one. Flat topography and an absence of protected wetlands were also a factor in the choice, as was the availability of the Sandersville Railroad to provide a line directly to the plant for coal hauling. Plant developers are negotiating with the county and state for tax breaks and other concessions that are typically offered to big projects with potential for job growth. Whether the coal plant ever becomes operational, energy is going to play an increasingly large role in the economic future of Washington County. The county already has two natural gas-fired peaking plants that are now among its largest taxpayers – surpassing kaolin producers. Washington County is also poised to benefit from a program most of the rest of Georgia rejected. Local voters became one of only three regions that passed a regional one-cent Transportation Special Purpose Local Option Sales Tax (T-SPLOST). Now work on road projects with economic development implications are getting underway. Over the 10-year life of the tax, the county will get about $60 million in all, he adds. The county has two projects on the regional list. One is a $40-million truck route around the perimeter of Sandersville. The new road will allow commercial traffic to move easily from the north side of the city to its south side without going directly through the town square. Set to begin in 2018, the project is part of a second tier of roadwork. More immediately, work will get underway this spring on a $2.8-million resurfacing of Deepstep Road. The goal is to transform the road into a truck route out to the four-lane Fall Line Freeway. Economic times have also been tough for local governments like Sandersville. As tax revenues declined, the city cut its workforce from 99 employees down to 85. The city laid off all its part timers and asked the remaining staff to do more. It also outsourced trash pickup to a private company to avoid buying new equipment. The city was forced to raise its millage rate for first time in nearly 33 years. Andrews hopes to be able to roll back that tax as the economy improves, but notes that at 4.5 mills Sandersville’s taxes are among the lowest in the state. One area that has received a lot of attention has been upgrades to Kaolin Field Airport. The airport recently got a new terminal and improvements to its fixed base operations. Having a runway long enough to accommodate corporate jets is a prime tool for economic development. Another area of improvement has been in the local real estate market. Sales are starting to rise after a long period of uncertainty. It still takes a long time to sell a home – typically eight to 10 months – but the numbers are increasing. Commercial real estate has not fared so well. In fact, the last time Webb’s company sold a retail property was nearly five years ago. Those numbers seem likely to change as efforts to recruit and retain industry continue. In Training: In another sign that the economy is coming back in Washington County, locals received some very good news indeed. Trojan Battery Co. announced plans to reopen a manufacturing facility in Sandersville, after exiting the market a few years ago. Production on a new line of sealed maintenance-free deep cycle AGM batteries is getting underway following installation of new automation manufacturing equipment. Some 70 employees will get jobs, with the head count rising to 110 by the end of the year. The facility will also manufacture flooded batteries, which are used in golf carts, electric transport vehicles, floor machines and a variety of other industries. To help get the company back in town, the county called upon the local campus of Oconee Fall Line Technical College to provide training for jobs utilizing advanced robotics. Not all the training local businesses ask for is so high tech. One kaolin plant asked for a program to instruct forklift operators in the right method for loading bags of processed clay powder into containers for shipping. The objective was to get as many bags as possible loaded without damaging them.